Data analytics is not a new concept. In fact, in 1962 John W. Tukey wrote “The Future of Data Analysis” where he begins to describe the difference between data analytics and statistics. The nuanced difference between the two is that data analytics requires the observer to decide what is important to analyze and what is not. The rise of the internet and personal computers continued to evolve data analytics as more information become more readily available. 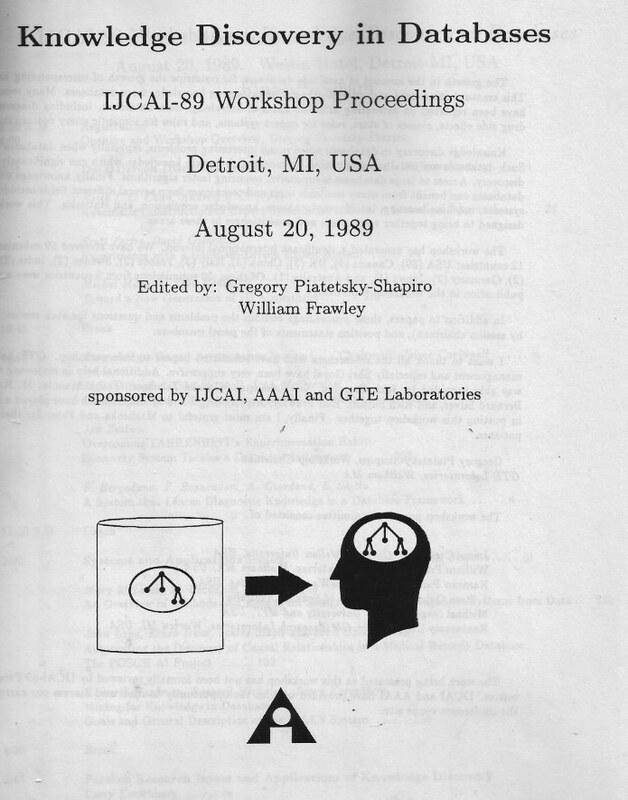 In 1996 a number of data scientists published, “From Data Mining to Knowledge Discovery in Databases” where they outline the difference between data mining and knowledge discovery. Data mining is the process of extracting data while KDD encompasses all subsequent processes required to actually gain insight from the data. Fast forward to 2009 and Hal Varian, Google’s Chief Economist, tells McKinsey that the ability to take data, understand it, visualize it, and communicate it will be the sexiest job of the 21st century. This is simply a result of data being free and ubiquitous, yet untamed and useless without the proper application. So what does this have to do with today’s private market investor? Investors working with private companies experience the same free and ubiquitous access to data that much of the tech industry realized in the late 2000’s but have yet to capitalize on the opportunity. If you take a random sample of fund managers and ask them how they leverage data from due-diligence, portfolio monitoring, or their own fund’s operation, the answer generally encompasses a mix of analysts, cumbersome excel files, and CRMs. The data is available but locked in an antiquated system. Herein lies the opportunity. The sheer amount of information sitting on the sidelines in a given private investment fund is incredible. From the historical and present performance of companies in the portfolio, to operations of the fund itself, to the vast amounts of data overlooked during due-diligence, underwriting, and business development that has historically been too vast and complicated to leverage. The current process is to collect monthly, quarterly, and annual reports from underlying assets (sometimes even weekly for the real estate folks), then aggregate these disparate reports into one cohesive report that should reflect the overall performance of an investment portfolio. Not only is this a cumbersome process that requires a tremendous amount of data entry by highly-paid professionals, it also only tells part of the story. Reports are fragmented and only reflect a company’s performance at a single point in time. To capture the whole story and report on the underlying data that drove that month-end performance would require too much work on the portfolio company and entirely too much information for a team of analysts to digest on a monthly basis. But, the fundamental issue and subsequent opportunity is that the data does, in fact, exist, and in today’s world is available to leverage with the proper tools. An example of a portfolio company connection on Malartu. Often times a private investor’s strength is in their network and experience. Their network of skilled professionals and their experience working with a large number of companies. At any given time a fund manager can work with 10’s if not 100’s of companies, all experiencing similar roadblocks and bumps from various market forces. The opportunity provided by benchmarking company performance across a portfolio in real-time is both incredible and completely unrealized. In the same way it is valuable to collect robust data on portfolio companies to give a clearer picture of performance it is valuable to uncover strategic advantages and prescriptions across a portfolio. Benchmarking uncovers opportunities that portfolio company executives could not see otherwise, both adding value to as a capital provider and a strategic partner. An example dashboard benchmarking a number of metrics. At the fund level, fund operations teams experience the same issues as the operations teams of their underlying portfolio companies. The irony is that the vast majority of fund operations teams have yet to leverage business intelligence tools their portfolio companies have been leveraging for years. Even in business development, the way funds find and close new deals is changing. Capital is being commoditized. It is the job of the Business Development Officer and Partners to convince an operator why their fund is a better fit than another. This requires modern sales and marketing techniques that are fundamentally useless without a thorough understanding of how they perform. They are useless without knowledge discovery and data. 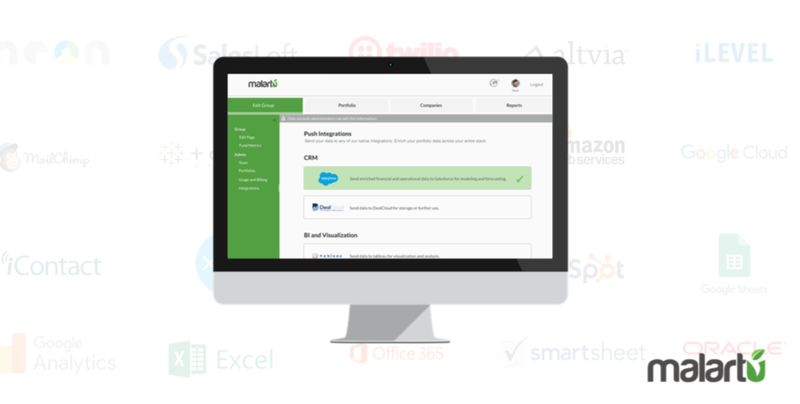 Example integrations for fund-level data. Many firms recognize the sheer number of companies they interact with in a given year but few recognize the amount of valuable data they leave on the table in doing so. Imagine if you could improve collection of data on prospective companies. This not only opens up the number of companies you can thoroughly vet before deciding whether or not to invest, it also opens up the value of going through due diligence with your firm over others. If you offer genuine insight after taking a look under the hood, your funnel will be full with companies not only looking for capital but the value in your process. 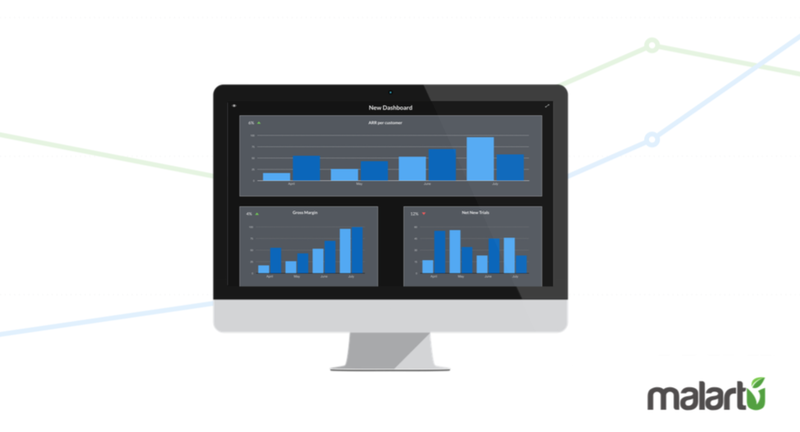 A dashboard displaying aggregated data across a handful of companies. True data analytics and knowledge discovery is a promising concept but, to date, has not been accomplished by the majority of private investors. This is the underlying mission of Malartu - to make it as easy and efficient as possible to collect, aggregate, and understand the vast amounts of data available to the private market investor. The easiest place to start leveraging data analytics for your fund is in your own fund operations. Often times funds have their own general ledger like Quickbooks, a CRM like DealCloud or Altvia, web presence tracked through Google Analytics, along with a handful of other programs. Connecting these tools on one unified platform is essential to scaling a successful investment firm as firms continue to differentiate from each other. Data collected from portfolio companies is often gathered through Excel and PDF reports, aggregated by an analyst, and eventually stored in a document storage program like Box or Sharefile. Implementing a data analytics platform that can easily aggregate this data not only saves time, but opens up endless possibilities for identifying growth potential in a portfolio. An automated data collection platform can not only collect a stream of data that displays the financial performance of underlying companies but also collect data that informs what drove those outcomes. As funds move toward building and growing profitable companies it’s imperative to have a clear view into the performance the fund’s operations, but also imperative to have the ability to drill down into the operations of underlying portfolio companies. Private market investors of any type scour through hundreds, if not thousands, of potential investments before landing on a handful of winners each year. There is huge opportunity in gathering more data on each of these prospective investments in order to make more informed decisions and add more value. 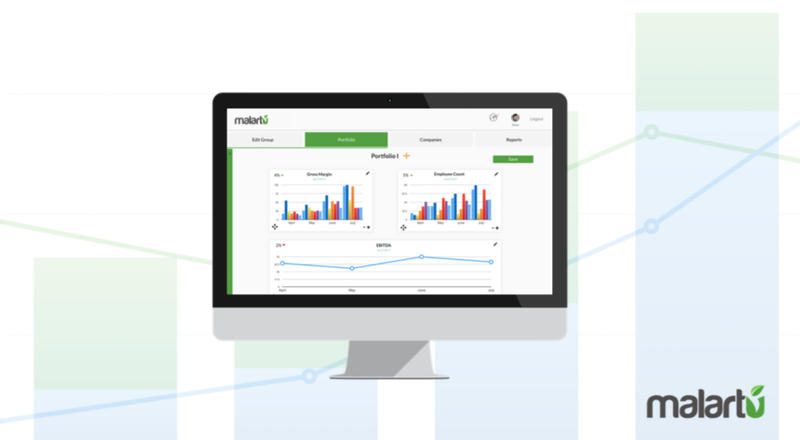 A data aggregation and analytics platform like Malartu can make collecting more information nearly 10X easier while providing the opportunity to benchmark that data across the rest of a firm’s network. This not only adds value to the fund manager but also adds value to companies vying for capital. Armed with a tool like Malartu, fund managers can offer genuinely helpful insight to companies whether they work with them or not, merely based on the data they’ve collected from their existing network. This inherent value-add naturally draws more promising companies to your firm, broadening the funnel while still speeding up decision making, due-diligence, and underwriting processes. By now I hope it’s clear the fundamental shift the right data analytics platform can bring to the private market investor. Malartu is on the bleeding edge of this shift. Talk to us about how we can do this for your firm, from giving you a clear look into your fund’s operations, capturing data in your pipeline, or automating your portfolio monitoring process.